SunWize, an OutBack/ETL Integrating Partner, offers pre-assembled power center assemblies listed to UL-508A. SunWize FLEXware power centers are assembled, wired and tested by SunWize in a code-compliant package. 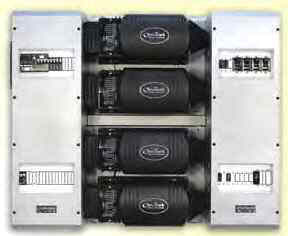 These FLEXware power centers are a modular building block for the OutBack FX and GFX series inverter/chargers allowing modular expansion from single inverter back-up systems to a multiple inverter village power system. SunWize FLEXware power center’s versatile design allows the choice of many installed options and offer a generous number of knock-outs allowing the installation of conduit, cable glands and other installation accessories. OutBack’s new, attractive FLEXware design also enables a lighter weight installation. The corrosion-resistant aluminum, silver powder-coated enclosures makes for a great looking installation that will last and look great for years to come. All FLEXware power centers are designed to be wall mounted for an indoor installation. The compact and flexible design of the mounting plate allows the inverters to be positioned in either a vertical or horizontal orientation for a professional-looking installation. For applications with more power requirements such as large homes, commercial or village power systems, the FLEXware 1000 supports up to four inverter/ chargers and four FM60 or FM80 controllers. Standard SunWize FW1000 power center assemblies include all of the protective over-current devices, four AC bypass breakers, four AC input breakers, four AC output breakers, five AC I/O bus bars, and DC main breakers. Also included is a HUB10 communications manager, 500A negative shunt, negative bus bar, ground bus bar, positive/negative DC bus bar, DC breaker bus bar and a remote battery temperature sensor. The FW1000-AC section functions as a 120/240V load breaker sub-panel with space for adding sixteen of OB-AC DIN mount breakers. The FW1000-DC section allows additional DC load circuit breakers, eleven OB-DC .75” panel mount breakers and three 1” wide breakers. Space limited when used with FM60 charge controllers and/or PV-GFP. Size: 40.6” H x 46.3” W. Unit weight: 329 lbs. Many installed options are available for adding charge controllers, AC/DC load breakers, PV ground fault protecti on, surge protection, step up/down or load balancing transformers and system monitoring.